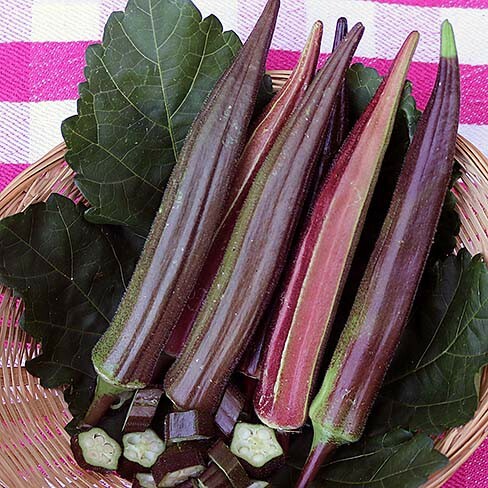 Okra Burgundy is an organically grown and very unusual and striking dark red till dark purple variety. It produces a prolific amount of long straight pods. It has a delicious flavour when the pods are harvested when they're about 6 - 8 cm in size. Okra is also known as Gumbo, Okro and Lady's Fingers. The pods colour green when they're cooked. Okra is a very healthy vegetable. Okra contains a.o. : vitamin A, B1, B2, B6, B11, C, E and K. And the minerals: calcium, phosphor, iron, potassium, copper, magnesium, sodium, selenium and zinc. It also contains a lot of fibres and nutrients and little calories. Okra is an exotic vegetable that can be used in stews, soups, stir fry dishes and as a binder in various dishes. 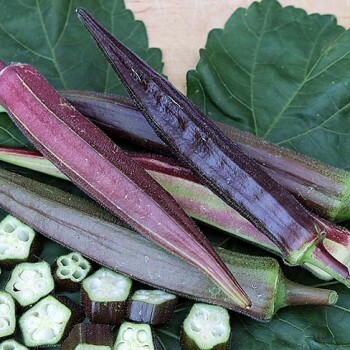 Okra can be cooked, baked, fried or grilled. Okra is delicious in combination with: aubergine, tomato, sweet pepper, onion, lamb, beef, sweet potato, garlic, ginger and bakkeljauw. Okra that's used for the binding of food should be cut into small pieces. For other applications, you must keep the Okra whole. Okra is used a lot in Cajun-, Creole and Suriname kitchen. And of course in Jambalaya. Don't cook Okra longer than 5 - 7 minutes. Non hardy annual. Okra needs a lot of light and warmth to grow well. Because Okra has a very delicate rootsystem, it's a good idea to sow in individual peat pots. This allows you to transfer the plants with peat pot into larger pots without disturbing the delicate root system. Sow indoors in individual peat pots filled with moist potting soil from March. Keep the germination temperature between 22 - 24 °C. Keep the temperature as even as possible and don't let the temperature drop during the night. Transplant the seedlings, as soon as they are large enough to handle, with peat pot in larger pots. Keep moist and don't let the seedlings dry out. Harden the seedlings of, by putting them for about 2 - 3 weeks in a room with a temperature between 15 - 18 °C, from the beginning of May. Put the young plants in a greenhouse, because Okra needs a moist and warm place with a soil temperature between 22 - 30 °C. Keep the pots apart, because the plants can grow to a large size (120 cm). Don't let the plants dry out. Water enough specially during dry-spells. Harvest the Okra after 55 - 60 days, after transplanting. The pods are then about 6½ - 8 cm in size. When the pods grow taller, they get hard and thready. Fresh Okra has to be eaten the same day, because it doesn't keep well. Harvest regulary to encourage growth. 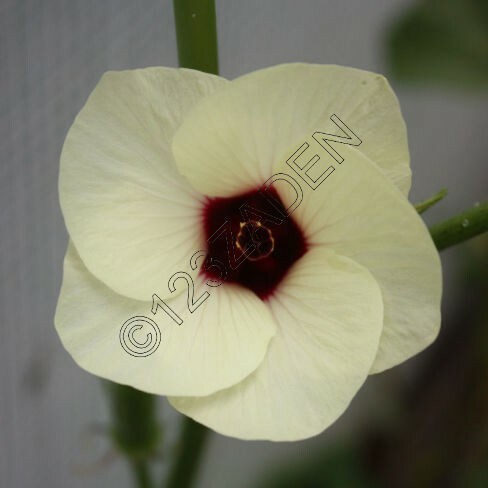 Okra can be plagued by aphids, spider mite and whitefly.